Thomas Stout joined Tidewater Community College after a successful career in the U.S. Navy. He served as an avionics senior chief, working on F-14s and aboard the aircraft carrier U.S.S. Enterprise. “I enjoyed avionics and also teaching. I did two instructors tours while in the Navy and became a master training specialist. I found my passion in helping people learn and succeed,” Stout said. After retiring from the Navy, he brought this skill set to the college in 2008. While still in the Navy, Stout enrolled at TCC, studying Electronics Technology under Professor Al Koon. 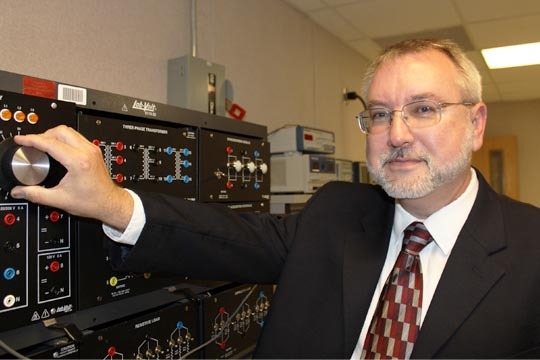 Stout continued his education at Old Dominion University, earning a bachelor’s in electrical engineering technology and later a master’s in electronics engineering through a fellowship at Norfolk State University. During his time at the college, Stout has been instrumental in launching programs in Renewable Energy Technologies, Marine Mechanical, Marine Electrical, Basic Metal and Plastic Machine Operator and Computer Numerical Controls Operator. “For me this is about sharing what I know and helping students prepare for the road ahead,” Stout said. “If you can use your hands and brains to make something, you always have a good paying career.